The aura of the physical body shows physical sickness or health, and all other conditions of the physical being. The emotional, intellectual, or spiritual reactions show in the aura of the respective subtle body. Each living being has a higher self or divine spark. This is the finest and most radiant of the subtle bodies, with the quickest frequency of vibration, because the higher the spiritual development, the quicker the vibration. Since the fall of the angels, the higher self surrounded itself slowly and gradually with various layers of denser matter, not quite as dense as the physical body, but infinitely denser than the higher self. Thus did the lower self come into existence. From your perspective, these layers are of subtle matter which you cannot see with your physical eye. We see both the higher self and the lower self. However, not all spirits can see all the subtle bodies of a creature; only those can who have attained a certain level of development. In other words, the mere fact that a spirit leaves its physical body behind does not indicate that it can necessarily see more than any of you. A spirit who has attained a certain level of development will not only be able to interpret the lower self, but will also be able to see through it to discover the higher self in all its splendor, because dense or physical matter does not represent an obstacle for our spiritual eyes and perception. So we can determine very well which thought-forms come from the higher self, and which from the lower self. We can also determine which wishes and endeavors of the higher self may be mixed in with tendencies from the lower self, the original shade twisted, colored, or dirtied. When messages from the higher self are tainted with lower-self motives, a disorder is created in the soul that makes its bearer emotionally ill. All the various tendencies have different colors and, in many cases different tones and scents. For example, a person may want something selfish and because he or she does not want to admit that this is selfishness, begins to rationalize the selfish desire and fool himself or herself about it. We can see all this very clearly, and, indeed, this kind of self-deception is very common among human beings. The forms of the higher self have an entirely different character than those of the lower self. I will return to the above example. The lower self dictates to the person to be quite ruthless about a selfish desire. It is not difficult for anyone of even the most limited intelligence to realize that by giving in to this desire he or she will be ostracized, or disliked by others—an outcome no one wants. Instead of overcoming selfishness by the slow process of development, people often act as though they were already unselfish. But they actually are selfish, and feel the selfishness. They hate the pressure of their higher selves to act contrary to the desires of their lower selves, but feel compelled to put on an act, which disturbs their inner peace, since it does not agree with their still predominant lower-self feelings. Their giving and their generosity are just a sham. In other words, the right act is entirely unsupported by the unpurified feelings, and therefore the person is at war within. The proper act becomes an act of necessity, of compulsion, instead of free choice. With such superimposed goodness does not count in the real sense. While you may give something, you may hate the idea. Not only do people remain convinced that they need to be selfish, but are also untrue to their nature, violating their reality and living a lie. I am by no means suggesting that it is advisable to give in to one’s lower nature; one must fight for enlightenment and strive for development in order to purify one’s feelings and desires. But if this is not accomplished, there should at least be no self-deception. One should have at least a clear and true picture about the discrepancy between feelings and actions. In this way, no mask self can form. Many, many people wear a mask, at least in some respects. This mask self presents to us a very ugly color, my dear friends. It is not dark, black, or sinister as are the trends of the lower self in different variations; the colors of the mask self are sickeningly sweet. If you are an artist or are artistically inclined, you know how to determine a good, genuine color or an unreal, sweetly artificial coloring. You even have created a word for bad art and bad coloring: you call it kitsch. It is the same with the tones and the odor of the mask self: they are sickly and nauseating. We spirits prefer the emanation and effects of the lower self, unpleasant as they may be for us, but at least they are honest. It is important for all of you to try to train your inner eye to see yourselves and other human beings from that point of view. The more you become spiritually awake, the easier it will be for you to accurately perceive yourselves and others. When you come in contact with the higher self once your intuition has awakened through your personal spiritual development, you will feel a distinct difference between the mask and the higher self. You will feel the nauseating manifestations of the mask self, first of all of your own, no matter how pleasant the mask may appear to be. If your psychologists, psychoanalysts, and psychiatrists would begin to view their patients from this viewpoint, they could accomplish a lot more. They would have success where they are still unsuccessful. The time will come when this knowledge will be theirs. When they are mature and courageous enough to include spiritual reality in their thinking, they will discover all this and prove the truth by their success with their patients. They will solve problems with their patients’, even though they cannot see what we can and what so far has appeared impossible to solve. The mere knowledge of these three parts of the human personality will make a tremendous difference in the results they will obtain, because they will, after some practice and study, determine easily which part of the self they are dealing with at a certain phase of the treatment. They will develop different means to deal with the different selves, and would know how to instruct the conscious and will-directing part of the person to use this information. It will make a great deal of difference. If a person is ready to accept help in that respect, the conscious and will-directing part of the self is on the proper road. What then remains to be accomplished is to penetrate the subconscious layers of the personality with these truths as well, so that all inner resistance will be overcome. This can be done only by the person himself. If you want to walk this path and be cured of your emotional sicknesses, it is important for you to understand all this. Even if you are not what is called a neurotic, and there are only minor deviations from the law within you, it will be very useful for you to understand all this and to meditate on it. It may explain why it frequently happens that a person undergoing psychoanalysis with a doctor who rigidly follows a school of thought that does not admit to any spiritual truth, and who is not very intuitive about such things, may plunge into a crisis in which his state of mind becomes worse than before treatment. Of course, there may also be doctors possessing good intuition and a strong sense of guidance, in which case the undesirable outcome may not happen quite so often or so strongly. But when the mask has been torn down and the patient is confronted with the lower self, the experience may be so shattering that the patient will break down completely, leave therapy, and suffer even more serious consequences. On the other hand, if this person were told what I am telling you here, and thus prepared for what to expect, so much hardship, and often even tragedy, could be avoided. If a patient knew that he or she has to face the lower self, which exists in every human being, and also knew that this lower self, unpleasant as it may be, is not the ultimate “I” or true self, and that the higher self, which is perfection, waiting to grow out of these layers of imperfection, is the true self, then this shock would not occur. Therefore, this knowledge is important for your psychologists and doctors of all kinds, as well as for all teachers and parents. It will help a great deal. Perhaps you have questions on this subject, my dear friends. QUESTION: What is the metaphysical explanation of allergies? For instance, people are often allergic to things they love. ANSWER: There may be different explanations for this. Generally speaking, it may be simply that the true personality is not allowed to evolve, that a mask is put over the personality and the inner reaction; or a revolt by the higher self may create certain physical symptoms in order to wake up the person and find out the reason. This is only one possibility; there may be others. Another possibility is that very often the human soul is torn apart by conflicting desires—one part of the personality wants to go in one direction, and another part in the opposite direction. These desires pull alternately. By keeping the conflict in the subconscious, the soul has failed to make peace with itself. There is a great strain and friction. As long as these currents are not brought into consciousness, so as to be examined and dealt with, as long as their true meaning and motive is not understood, the inner fight cannot be settled. However, the lower self works against bringing anything out into the open. And as long as the conscious and will directing part of the personality does not take charge, the inner fight and friction goes on. Since all this takes place in the unconscious, what comes out are the symptoms, which may be tiredness, allergies, and various other physical symptoms. These conflicts actually create a short circuit in the soul. A third alternative is that there may be a shock reaction in the life of a person. This person has put the original incident into the subconscious, and does not consciously remember it at all. A food, plant, animal or some such thing may have been involved, even indirectly. Since the person has this association, he or she reacts accordingly. The incident may have occurred in childhood, or earlier in infancy, or perhaps in a previous incarnation. It is not always necessary to remember the actual incident, although this can help, too. The main point is that the wrong inner reaction that has created this evil should be cleared away. Whenever anything is repressed into the unconscious, you can be quite sure that some sort of inner wrong reaction has taken place. Generally speaking, any of these alternatives or their variations may be responsible for allergies. There may also be other possibilities, but it is quite impossible for me to go into all the details now. I am just giving you a general overview. QUESTION: There is a lot of hypocrisy in this world, which is of course the mask self. It is encouraged by the world, because the world wants to see good. From the viewpoint of the whole world, is it not preferable to do and act right, even if it is a mask, than to remain in one’s lower self when one cannot eradicate it? ANSWER: Everybody can eradicate it, if they really want to do so. It is only a question of how much can be eradicated in the present incarnation. However, enough can be eradicated so that you will not commit crimes or do harmful things to others. 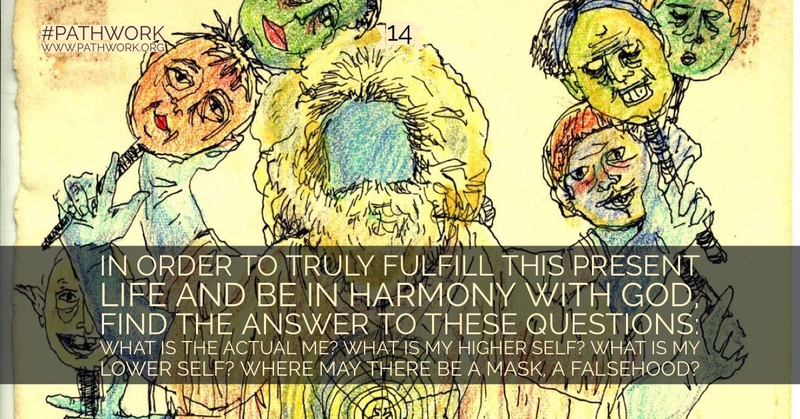 Besides, one does not have to choose between giving in to the lower self and creating a mask self. As I have explained it, even if the feelings cannot be purified at once, because this takes quite a long time and a combination of effort and patience, you can become aware of your own imperfections, unclean desires, and lower nature. At the same time you can still act in accordance with the standards of your society, as opposed to believing that the mask self is your true nature and real self, thus fooling yourself and creating an inner lie. In other words, you do not have to choose between becoming a cannibal, if this is your lower self, and becoming hypocritical and fooling yourself. Even if you cannot or will not do what is needed to transform yourself, you should be aware of your lower self and know that you act according to necessity and your own convenience while your feelings are still unpurified and not always in accordance with your outer actions. Although you are taking the path of purification, you will not have any measure of success until you are willing to wait and work, work and wait. In the meantime, self-honesty is absolutely essential as a necessary requisite for any success in this most wonderful venture. But even if you are unwilling to take this road, it is infinitely better to have no self-illusions than to create this unhealthy and sickly aura. QUESTION: How is it possible to undo what your lower self has manifested in the way of physical illness? ANSWER: In the first place, my dear friend, you should not try to eliminate the consequences first; that would be too easy. If your lower self has created an illness, the illness has to be accepted first. You should go about finding the roots or the part of your lower self that has created this illness. The lower self has to be met and completely explored. Your aim must be purification and perfection for its own sake. You do it for the love of God that you have in you, and not in order to avoid putting up with a discomfort. True, it takes a lot of overcoming and inner strength to sufficiently purify the motives first, but that is the necessary foundation. While doing this, you are at the same time learning a lot of other things. Thus spiritual strength grows as you learn to apply absolute self-honesty. Once your motives are pure, the sickness will not matter half as much as the state of your soul. To the degree that the ego and the comfort of all that goes with it loses importance, you will have followed a very important spiritual law. Thus health will be gradually restored. This law has to do with the giving up of the ego-self which Jesus taught. Only thus will you win your life. So begin by meeting your lower self with courage, optimism, humility, and in a spirit of warfare, so to speak. Once you discover your lower self, and shed all the masks and all the covering layers, you will begin to work on the different aspects of the lower self. You do this by daily observation and self-testing, observing again and again how far your inner currents still deviate from what you wish them to be. As you do so, and become master over your lower self, you learn real self-honesty, and your motives for development become purer and purer. Your vision will widen, enlightenment will be given to you, and your illness will gradually disappear. So you should not even think of your illness first, but of the root of the problem. That will be the only lasting success—the only one, my dear! If your wish is recognized in the spirit world, if you truly want to purify yourself, not merely rid yourself of unpleasant consequences that are most visible or noticeable to you, help and guidance will come to you, so that you can do battle with your lower self, since no one can do it alone. QUESTION: I asked last time why Hindu philosophy does not have the fall of the angels. You promised that you would answer it tonight. ANSWER: There are about three reasons for that, and each reason is a good one. The first reason is that Eastern philosophy rightly puts spiritual progress above all. Everything else that has ever happened in creation is only of secondary importance, and this is very true, my friends. However, it is useful in some cases that light be shed on certain facts that occurred in the distant past, because the reason of existence on earth, the reason for evil, and answers to other questions are necessary for some people to know. The understanding of certain facts, even if they can only convey a very general and broad picture, will eliminate doubts that may stand in the way when deciding on the path of perfection and purification. For the most part, the souls incarnated in the East do not feel as strong an urge to probe and search in this respect as does the Western mind. Therefore, they say: We do not need to know anything else; the important thing is how we develop. The second reason is a little bit more complicated to convey to you. I once gave a lecture about the two main aspects of God: the active or male aspect and the passive or female aspect. I explained that in the active aspect God is personality: active, thinking, planning—the Creator. In the female aspect God is in a state of being. From the explanation in that lecture it will be easy for you to recognize that Eastern teachers and philosophers have experienced God in the female and passive manifestation. That is a partial answer to this question. The fall of the angels shows the events in creation where God manifested as Creator and therefore in his male aspect. In this tragedy God was enacting and creating new conditions whereby the return to Him would be assured eventually to all creatures. It is, therefore, understandable that a philosophy experiencing God in the female aspect would be less likely to receive enlightenment regarding God’s male aspect; while Western philosophy, open to the experience of God’s personality aspect that is active, would be blind to the experience of the female side of God and enlightenment in the Eastern sense. The third reason refers to the fall of the angels as having a great deal to do with the spirit of Jesus Christ. He plays a major part in the fall of the angels. Eastern religion, having received a number of emissaries of its own—often very great, very exalted, and very highly developed spirits—is reluctant to recognize that others, in many respects not as spiritually advanced as themselves, may have received an even greater one: in fact, the greatest of all created beings. This is understandable and typical of human nature. Your logical conclusions can be very limited, and then you miss the complete picture. These three reasons together give the main explanation, or at least answer your question best. I do not doubt that other explanations may be found too, but these are undoubtedly the most important ones. Is that clear? QUESTION: I still do not understand. I understand that one of the reasons has to do with Jesus Christ, who played this important role in the Fall, but why don’t they have something similar to it? ANSWER: This is so because, as I said, the other reasons count too; because they do not consider it very important to know about these things; because they have experienced God differently and not in His active aspect. One reason plays into the other, one supports the other, and all three make a whole. QUESTION: Is that perhaps the reason why the female aspect of God is recognized more there and the male aspect of God more in the West and that is why East and West ought to get together? ANSWER: Certainly. It also explains that in the East spiritual development is much farther advanced, and it is usually the woman who is spiritually more awake or easier to guide. In the West, technique and material progress are farther advanced because this, in turn, is typically a male aspect. It is again the creating, the doing, that are manifested. And the two should unite, because they complement each other and it would create a wonderful wholeness if they could exchange the knowledge each has in advance of the other. QUESTION: Does that mean in general that the Eastern teachings have lived through a different phase of Brahman and want to go into finding the Brahman where all these things are one? ANSWER: Yes. And it should be. Again in this respect, as far as spiritual and religious teachings are concerned, the Western and the Eastern side should unite, because both sides will furnish the complete picture only when put together. Each has only a half now, and when they unite and “marry,” then humanity will have a great deal more understanding about spiritual truth, and more enlightenment is bound to follow. QUESTION: Is the fall of the angels within Maya? ANSWER: Oh no. Oh no. Maya is a result of it, my friend. QUESTION: How do the spirits learn language? And can they use languages not known to the medium? ANSWER: I will answer both questions. The spirits in the spirit world do not use human languages among each other, of course. They do not need that, for we have the spiritual language. As I have explained, each thought creates automatically a form and becomes apparent. So that is our language. We spirits only learn languages for very definite and good purposes. In other words, if we have a task to fulfill with human beings, we need the knowledge of your human languages, not only in connection with mediumship. When a spirit has the task to guide a human being who is no medium at all, it still has to know the language its protege knows, although we see the thought of the respective human being too. Now, it may be the case, of course, that a spirit is chosen as a guardian who, remembering his last language on Earth, does not have to learn the language anew, and will be assigned to a person who speaks that same language. But there are special instances where the learning of a language becomes necessary and for that we have schools, just as you have schools. We have schools for many, many subjects, and language is one of them. But we learn them easier, because, here again, matter does not stand in our way and that even applies to languages. How that applies is impossible for you to imagine and I have no words to describe it. You just have to use your intuition, your feelings, and perhaps you will sense what I mean by this. So it is easier for us to learn languages than it is for human beings. As far as your second question is concerned—whether a spirit can speak through a medium in a language the medium does not know—the answer is yes. And it has happened many times. But there is a very definite and distinct type of mediumship necessary for that. There are many different types of mediumship, even of trance-mediumship alone, not to speak of all the others. There may be “direct voice mediumship,” when you hear the actual voice of the spirit in a different part of the room. There may be materialization, levitation, and many more phenomena that I cannot even enumerate here. One such phenomenon is—and the Bible refers to it too, using the word “tongues” for languages—that a language is spoken through a medium that he or she does not know. But for all these different types of mediumship, a special training of the medium, as well as for the spirits in connection with the medium, is necessary. It is a different form of materialization or transfiguration. There are, for instance, mediums whose actual faces take on an entirely different shape, even a different bone structure. This is what may be called “transfiguration.” The speaking of foreign tongues is an auditory transfiguration. But as I said, different conditions have to be fulfilled with each of these types of mediumship. The spirit world of God is a world of order. When it is recognized here that a human being can fulfill a task as a medium, it will first be determined for what type of mediumship this person’s particular talent is best; what may be the most important task for the living conditions and surroundings of that particular person; and according to all these considerations—and the most important consideration from our viewpoint is always what is best for spiritual development and what serves the Great Plan most efficiently and not what may be sensational and phenomenal—forces are set in motion to train this particular medium for his or her task. Once this task has been chosen and worked for, it is unlikely that there will be any changes in the type of mediumship, unless there is a real, good, and spiritual reason for it. Thus works the world of God which, as I said, is above all, a world of order. QUESTION: I wanted to know what the spiritual world thinks about this new planet Sputnik? ANSWER: That, my dear, depends entirely on the spiritual, moral, ethical attitude of all concerned. The thing itself is of no importance as far as we are concerned. Nothing in itself is, from our point of view, of any importance. The only importance is what you human beings make of it. And with that, my friends, I leave you with the blessings of the Lord. Go your way in peace; know that God is present within you, and try to find Him. Do not let the clouds of the powers of darkness destroy your sight and your sense of truth that every so often touches your heart. Be in God.